Noam Chomsky is afraid. Addressing a crowd at the Orpheum Theatre in Madison last April, the left's leading intellectual sent out a warning. "I'm just old enough to have heard a number of Hitler's speeches on the radio," he said, "and I have a memory of the texture and the tone of the cheering mobs, and I have the dread sense of the dark clouds of fascism gathering here." Chomsky continued, "The level of anger and fear is like nothing I can compare in my lifetime." The impetus for the professor's alarm is the Tea Party, the latest in a long line of right-wing social movements. The emergence of this movement in 2009 rattled the parameters of the American national discourse and shook commentators on the liberal-left into a frenzy. MSNBC ran specials on Timothy McVeigh and right-wing militias, while The Nation columnists like Melissa Harris-Perry invoked the specter of "a vicious new Jim Crow terrorism." The Tea Party was, from the outset, targeted with invective designed to isolate and marginalize. This strategy is not surprising. The American left's response to grassroots activity on the right has historically been punctuated by hysteria, exaggeration, and appeals to the coercive power of the state. This article aims to identify the dominate narratives spun by the liberal-left, as represented by its major intellectual organs and prominent commentators, which have ranged from identifications of a proto-fascist movement animated by the resentments of downwardly mobile white workers to, on the other extreme, apologias for the political activity of a besieged and embittered petit-bourgeoisie. Furthermore, an alternative reading of the Tea Party will be offered, a movement that is not fascistic, racist, nor particularly novel, but rather a new expression of a venerable American right-wing populist tradition. Finally, this essay endeavors to reveal the roots of reigning liberal-left analyses in the historic lack of a national labor party, a particularity that has focused the left's vitriol onto their opponents on the right rather than the true stakeholders of power. In March 2010, just days before Chomsky's speech, The Nation's subscribers were e-mailed their own breathless appeal. The message noted the "bigoted language," allegedly encouraged by GOP officials, of right-wing protesters outside the Capitol. It warned that, "There are historic lessons to be learned. But they are the lessons of the 19th century not the 20th. We must now guard against the descent of a vicious new Jim Crow terrorism." Readers and potential donors were reminded that "since 1985, subscribers have known The Nation as a kind of early warning system." This call-to-arms matched the tenor of a swath of the left that saw the Tea Party as a threat to be confronted using the language of the anti-fascist and anti-racist movements of bygone eras. The content of this particular attack on the "Tea Party resistance" was the product of Melissa Harris-Perry, an intellectual who has become increasingly prominent on MSNBC and in the liberal print press over the past two years. Her commentary on the Tea Party, alongside those of other Nation contributors like Richard Kim, can be regarded as representative of dominant liberal opinion during this period, an opinion that, through the launching of a regular column "Sister Citizen" in The Nation and the marginalization of more radical, dissident voices like Alexander Cockburn, represents an effective editorial shift to the right, as the liberal press, strident in their opposition to Bush, transformed itself to play the role of critical supporter during the early years of the Obama administration. This critique of the Tea Party, harping on the movement's rhetoric and supposed "extremism," comes from the political center and not the left. The legitimacy of insurgent popular protest itself, as opposed to tactical lobbying and electioneering has been explicitly called into question by Harris-Perry. Writing in late 2009 for The Nation, in a piece titled "Lose the Love/Hate, But Keep the Hope," Harris-Perry expounded on ways to "hold onto hard won optimism while still demonstrating emotional restraint in the public sphere." Progressives, she argues, have been too confrontational, apt to adopt a posture of "holding Obama's feet to the fire," a strategy that represents "an old fashioned way to approach being part of a governing coalition." The rise of the "screaming" Tea Party, with its "town hall shouting matches," Harris-Perry argues, shows the limits of this adversarial form of politics. In place of "outsider angst," Harris-Perry proposes that members of the working class who wish to effect change should remember the lesson of the Obama campaign, which saw unprecedented numbers of donors successfully fund his push to the presidency. "[Getting] friends to commit $50 to Obama 2012 if he commits to saving the public option," or creating a blog or YouTube videos are proposed tactics in this new political strategy. The left is urged to "Put down the hammer and try a screwdriver" and to "ask what we can do to help Obama achieve a new direction for America." Even these tactics, however, should be used tepidly. The election of Obama opened up new avenues of political engagement, but did not give progressives the mandate to fulfill the policy agenda that Obama ran on. Lambasting "a winner-take-all mentality that has led to tyrannical governance, which fails to protect the interests of political minorities," Harris-Perry reminds readers that, "We won an election; we did not stage a coup. The left will get some, but not all of what it wants, and that is OK. It is better than OK, it is the heart of democracy. Winning does not give us a mandate to ignore the interests of those we defeated." This style of political engagement is a corollary to U.S. labor's focus on insider lobbying and fundraising, as opposed to the street mobilizations seen in Europe. Speaking to the New York Times, Leo Gerard, president of the United Steelworkers, postulated that all labor needed was enough expert lobbying in Washington to attract the support of a few more senators. Harris-Perry's frequent evocation of the Civil Rights movement is used in this context to damn the radical forces thwarting, rather than facilitating, President Obama's agenda. In an essay written for the occasion of Martin Luther King Day in 2010, "How Barack Obama is like Martin Luther King, Jr.," she attempted to deconstruct the left's false burnishing of King. She presents King as a pragmatic political strategist who shrewdly turned his back on Bayard Rustin, among other leftists, specifically because he was a homosexual socialist. Furthermore, King's undercutting of the Mississippi Freedom Democratic Party is lauded by Harris-Perry as a precondition for the passage of the Civil Rights Act. The piece is indicative of a shift in The Nation from the scathing denunciations of the "war crimes" of the Bush administration to one that urges patience and faith in the Obama White House. "The Tea Party is a challenge to the legitimacy of the U.S. state. When Tea Party participants charge the current administration with various forms of totalitarianism, they are arguing that this government has no right to levy taxes or make policy. Many GOP elected officials offered nearly secessionist rhetoric from the floor of Congress this weekend. They joined as co-conspirators with the Tea Party protesters by arguing that this government has no monopoly on legitimacy." The very ethical and legal legitimacy of right-wing protest is called into question in the context of the racial slurs allegedly hurled at Representative John Lewis, a veteran of the Civil Rights movement, at a Tea Party mobilization in March 2010. Harris-Perry argues that such animus directed at " duly elected representatives of the United States government is more than an act of racism. It is an act of sedition." "[That] 1915 film depicts the racist imagination currently at work in our nation as a black president first appoints a Latina Supreme Court Justice and then works with a woman Speaker of the House to pass sweeping national legislation. This bigotry assumes no such government could possibly be legitimate and therefore frames resistance against this government as a patriotic responsibility." It is assumed, without sustained analysis of the actual social forces and ideological composition of the Tea Party, that their opposition to the Obama administration is rooted in its diversity rather than the content of the "sweeping national legislation" that liberals champion. The Tea Party, by virtue of opposing an African-American president, is condemned to an original sin of racism. They are criticized not for their specific policy goals — revolving mostly around the federal budget, the defense of Second Amendment rights, and taxation — but simply for their alleged opposition to the mainstream consensus and its respected doyens, such as Representative Lewis. The cries of treason and sedition are striking, but not without precedent in the history of American liberalism. In particular, the "brown scare" of the 1930s saw liberals and communists complicit in not only the demonization, but the denial of personal liberties of their right-wing opponents. Such tactics were used again in the McCarthy-era, only against communists and their alleged "fellow travelers." But the allegiance to an Establishment political consensus is not at odds with the legacy of an American left that has long, in all but its most petty and marginal quarters, ceded legitimacy to the bourgeois state. It was in this context that Harris-Perry argued in a Nation piece on the "Don't Ask, Don't Tell" policy that "Military service is at the heart of citizenship." She continued, "The implied social contract that binds a nation to her people is most fully realized in two primary acts: tax paying and military service," defining the military as, "Those who willingly risk their lives to protect the borders and ideals of their country." Such rhetoric does not contradict the corporatist class compromise that sustains the center-left's political and economic agenda. But The Nation, the self-proclaimed "flagship of the left," was described by its former editor, Victor Navasky, as a debating ground between liberals and radicals. With the global collapse of the anti-capitalist movement, the debate has seemingly ended, as well. I will discuss below the historic factors that encouraged facile analysis, centered around cursory and unsubstantiated allegations of racism, as well as questions of "legitimacy," in The Nation and other left-wing outlets commenting on the Obama administration's right-wing opponents. Melissa Harris-Perry was not the only self-avowed member of the left adopting the lexicon of nationalism. Justine Sharrock's "Oath Keepers and the Age of Treason," a narrative piece starring Private First Class Lee Pray, is a riveting account of a blue collar delinquent turned soldier who became radicalized by conspiracy theories. Pray is a member of the Oath Keepers, a group formed by former Ron Paul aide and Yale-bred constitutional lawyer Stewart Rhodes. The Oath Keepers pledge to not obey any future "un-Constitutional order" — from warrantless searches to herding citizens into internment camps. The group has been surprisingly well-received by figures on the right. Pat Buchanan, Glenn Beck, and Lou Dobbs, in addition to more radical voices like Alex Jones have sung its praises. The reception from the Anti-Defamation League and liberal commentators like Chris Matthews was, as expected, less than cordial. In a combative interview with Matthews, Rhodes stated that members of his group would not have been complicit in many of the crimes of the 20th century — the My Lai Massacre, the internment of Japanese-Americans, and the rise of Nazism in Germany, among them. Does the reaffirmation of a Constitutional oath constitute treason? Sharrock's charge against the Oath Keepers — "treason" — is significant, because it charges the group with presenting a danger to the state, rather than ordinary citizens. It is an allegation that fits within the organization's own ideological framework — loyal Oath Keepers versus a potentially tyrannical government. The piece also deliberately plays up the Oath Keepers involvement in the Tea Party movement, while presenting no empirical documentation of its membership size or how popular it is within the wider social movement. It is significant that Mother Jones devoted so much space to a group of little discernible import. The operative effect was to stoke fears of a rising and vengeful right, a group Rolling Stone's Matt Taibbi calls "nativist freaks, village idiots and Internet Hitlers," at a time when both houses of Congress and the presidency were in Democratic hands. But these liberal publications were just part of a larger trend. The New York Times' Frank Rich responded to the murder-suicide of Andrew Joseph Stack III, the terrorist who flew a small plane into a Texas Internal Revenue Service office building, by summoning the memory of the Oklahoma City bombing. Drawing upon the Times' own David Barstow's "chilling, months-long investigation" of the Tea Party movement, Rich identifies an "axis of the obsessed and deranged," writing, "Anyone who was cognizant during the McVeigh firestorm would recognize the old warning signs re-emerging from the mists of history." The author points to the far right's resurrection of familiar conspiratorial tropes, as well as an alleged uptick in white supremacist and paramilitary militia activity. Rich cites an August 2009 publication, "The Second Wave: Return of the Militias," from the Southern Poverty Law Center, which documents the resurgence of the anti-government "Patriot" movement, a hodgepodge of militia members, tax defiers, and self-proclaimed "sovereign citizens." Another article produced by the organization, "Nativists to 'Patriots,'" contends that the border vigilantes of the Minuteman Project have shifted their attention from "border security" and defense against "reconquista" plans by the Mexican government to retake the American Southwest to the anti-Washington politics of the "Patriot" movement. An important source for Rich's missive, the Southern Poverty Law Center was founded as a civil rights law firm by Alabama lawyer and businessman Morris Dees and his associate Joseph J. Levin Jr. in 1971. Throughout the 1970s and 1980s the group engaged in litigation against, and monitored the activity of, the Ku Klux Klan and its affiliates. Its original Klanwatch project, now Hatewatch, has been expanded to include new types of discrimination. More recently, the Law Center has documented and publicized the 75 supposed plots, conspiracies and acts of terrorism engaged in by the American right since the Oklahoma City bombings. Their annual "The Year in Hate & Extremism" reports have also claimed to register a massive uptick in the number of hate groups, which now stands at "926, up 4 per cent from 2007, and 54 per cent since 2000." However, their definition of a "hate group," as "one with beliefs or practices that attack or malign an entire class of people," is broad. By this criteria, the advocates of class struggle and industrial action on the left are engaging in the same kind of hatred as biological racists and white supremacists. Harper's Ken Silverstein has called the Law Center "essentially a fraud [that] has a habit of casually labeling organizations as 'hate groups'," with the effect of stifling free speech and debate. "[D]espite the SPLC's predictable howls about an uptick in its chapters, is a moth-eaten and depleted troupe, at least 10 per cent of them on the government payroll as informants for the FBI. As Noel Ignatiev once remarked in his book Race Traitor, there isn't a public school in any county in the USA that doesn't represent a menace to blacks a thousand times more potent than that offered by the KKK, just as there aren't many such schools that probably haven't been propositioned by Dees to buy one of the SPLC's 'tolerance' programs. What school is going to go on record rejecting Dees-sponsored tolerance?" Commentators like Rich uncritically use Law Center broadsides to present a view of the United States' political landscape that is ravaged by racial animus and filled with menacing foes doing combat drills in the woods, preparing for a coming insurrection. Such a national portrait, I argue, is distorted, misrepresents the Tea Party mainstream, and illustrates a disconnect from the hardships and threats actually facing working families. More exhaustive than Rich's, Barstow's more sympathetic account of the Tea Party describes the movement as sprawling, loosely structured, and defying easy definition. The shared commonalities are worrying, however: paranoid views about government activity, opposition to existing public services, and a fear of co-option through "hijack attempts" from more moderate state and county Republican Parties. Not all Tea Party "patriots" are newly politicized. Barstow notes coalition work done with cadre from established fringe organizations such as the anachronistic John Birch Society and the Oath Keepers. The Birchers in particular, a group that hasn't entered the public imagination since the height of the Cold War, have caught Sean Wilentz's attention. In "Confounding Fathers," a New Yorker essay from October 2010, Wilentz connects Glenn Beck's view of American history and that of the Tea Party to the "paranoid politics" of the 1950s. Wilentz's analysis is indebted to Richard Hofstadter's Cold War-era historical essay, "The Paranoid Style in American Politics," which surveys "movements of suspicious discontent" throughout American history. For Wilentz, one of the "defenders of national cohesion and tempered discourse in our politics, it is an alarming state of affairs," that the "extreme right-wing," represented by Beck, the Birchers, and their fellow travelers in the Tea Party, might achieve a measure of clout in Congress. He invokes the struggle of William F. Buckley, Jr., the editor of National Review and an intellectual guidepost for anti-Bircher conservatives during the Cold War. Such an analogy represents an explicit attempt to differentiate between a "legitimate" right-wing and an extremist one, echoing attacks on Goldwater Republicans during the 1960s. It seeks to marginalize and isolate the Tea Party by placing its rhetoric and demands outside of the mainstream of acceptable politics, instead calling for a conservative force capable of playing the role of "loyal opposition." Commentary from the far-left of the political spectrum has been even more effacing. 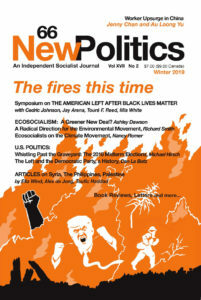 New Politics, an independent socialist journal with a "Third Camp," democratic Marxist editorial bent, features an editors' note in their Winter 2010 issue that epitomizes leftist fears about a more visible right. The editors describe the progressive's dilemma at the present conjecture. They are "disappointed" with the initiatives of the new administration and feel like "Obama has sold short his progressive supporters," but they also "are appalled by the neofascist right wing assaults on Obama." These assaults are said to have support from millions. To combat this threat the editors urge leftists to not despair or relent in resisting right-wing enemies of the Obama administration for fear of "[replicating] the actions of many German leftists of the early 1930s who directed their main fire not at the Nazis, but others on the left." Though opposition to the administration from the left is still encouraged, it is made explicit that the left's "main fire" should be directed at their mirrors on the right and not policy makers in Washington. "Whatever backwash they got from the stimulus often wasn't readily apparent. They can't afford health plans for themselves or their employees. They're three or four payrolls away from the edge of the cliff, and when they read about trillions in handouts for bankers, trillions in impending deficits, blueprints for green energy regs that will put them out of business, what they hear is the ocean surge pounding away at the bottom of that same cliff." With no one in establishment politics in their corner and a left oozing with disdain, the Tea Party is this class's only outlet for political articulation. While acknowledging the "nuts and opportunists" within their ranks, Cockburn contests that these types are found in any social formation. In his conception the Tea Party aren't the heirs to "Jim Crow terrorism," but can trace some of their ideology to another nineteenth century movement of the right: the Know-Nothings, an anti-Catholic nativist group that espoused "Protestant republicanism." The core of Cockburn's critique of the left is that they are wasting valuable column space and political capital scaremongering about the right at a time when the center-left is nominally in power and the only political ferment is coming from the Tea Party. There are other left-wing commentators willing to commiserate with the supposed grievances of the new right. In an interview with the radical quarterly Jacobin, literary theorist and critic of "identity politics" Walter Benn Michaels, identified the Tea Party as a reaction against neoliberalism. Michaels doesn't view the challenge as a serious one, but also stresses that the movement, "is not simply a reaction against neoliberalism from the old racist right." He contests the American left's desire to summarily reduce the Tea Party to racists: "They're thrilled when some Nazis come out and say 'Yeah, we support the Tea Party' or some member of the Tea Party says something racist, which is frequently enough." Michaels finds the subversive content of their political program in an opposition to illegal immigration. The Tea Party recognizes that "one of the primary sort of marks of the triumph of neoliberalism in the U.S. is a very high tolerance of illegal immigration, and that illegal immigration is the kind of ne plus ultra of the labor mobility that neoliberalism requires." The rise of illegal immigration represents a new form of capitalism, as opposed to the old "meritorious" capitalism of the post-war period. When right-wing ideologues attack "communism," the argument goes, they are actually conceptualizing neoliberalism. "… people in the Tea Party movement have a problem that is realer than 'White male status anxiety,' that the economic shifts that are taking place, the more and more extreme inequality, the more and more going to the top, no doubt some people may be unhappy because of loss of status, but many millions more are going to be unhappy because of the loss of actual money. So my point isn't really to deny the phenomenon of status anxiety, it's just to point out the extraordinary eagerness of American liberals to identify racism as the problem, so that anti-racism (rather than anti-capitalism) can be the solution." Michaels' conclusion is, in sum, that students of Friedrich Hayek and exalters of Ayn Rand are the most visible source of resistance to neoliberalism on the American scene. Such a view, I believe, is as contradictory as it appears. Furthermore, Michaels' attack on the concept of "open borders," which he believes is a neoliberal construct to be combated, is representative of a left-nationalist outlook that opportunistically plays to xenophobic tendencies in American politics. A truly radical political discourse would be one that confidently defends the right of people to free movement, while critiquing the economic pressures that cause social dislocation in the first instance. Dispassionate examination of contemporary movements is not an easy task. With little empirical evidence and only a few surveys to rely on, with the contradictions endemic to any inchoate movement on display, the task becomes almost impossible. Still, the impressionistic and polemical quality of the majority of the liberal-left's coverage of the Tea Party has been striking. So too has been the reply of dissenters like Cockburn and Michaels, who have made sweeping pronouncements about the social basis, grievances, and political aims of the new right with little substantiation. Several significant national surveys of the Tea Party movement have been conducted. A CNN/Opinion Research Corp. survey released in February of 2010 indicates that Tea Party activists heavily favor Republicans over Democrats, despite describing themselves as "independents," and tend to be male, rural, "upscale," and conservative. The "upscale" descriptor refers to both above average educational attainment and annual income. Nearly three quarters of Tea Party cadre have attended college, compared to the 54 percent national average. Three quarters of them also self-identify as conservative. The study places active support — those donating money or attending a rally or meeting — for the movement at 11 percent of the population. 24 percent more have a favorable disposition of the movement. This group can also be described as disproportionately male, high-income, and conservative. A plurality, 45 percent, don't know enough to form an opinion on the protests, while only 20 percent oppose the Tea Party. With a sample size of only 1,023, including just 124 Tea Party activists, the CNN study is by no means definitive. A survey from the conservative Winston Group, a firm headed by former Speaker of the House Newt Gingrich, however, came to similar findings, demonstrating the conservative nature of the group and their alignment behind key planks in the G.O.P. Platform. The most exhaustive study on the movement, a New York Times/CBS News poll from April of 2010 also shows the Tea Party to be loyal Republicans, conservative, as well as more affluent and better educated than the public at large. The study makes clear that their opposition to the Obama administration is rooted in political ideology and not personal anxiety about household finances. Public trust in government institutions hovers near historic lows and the Tea Partiers reflect this trend. The 92 percent of them would like to see a smaller government even if it means fewer social services. This is despite the fact that activists were more likely to be directly benefiting from Social Security and Medicare. They, not surprisingly, share the general public's support for those two programs. Surprisingly, only 40 percent of Tea Partiers polled in the New York Times/CBS News study think that Sarah Palin would make "an effective President." Large majorities, however, hold favorable opinions of both George W. Bush and Glenn Beck. On race relations, a point of important contention for Tea Party critics, cadre, 89 percent of whom are white, were more apt to think that blacks and whites already have an equal opportunity to succeed. 52 percent venture to say that too much has been made of the issues facing African-Americans in recent years. A strong 65 percent, however, think the policies of the Obama administration do not disproportionately favor either blacks or whites. Significantly, Tea Party "patriots," like their fellow citizens, care more about economic issues than social ones. Activists are split, making them almost exactly in line with the general public, on legal immigration. Yet 82 percent see illegal immigration as a "very serious" problem. But the majority, 57 percent, favor gay marriage or civil unions. Most also favor abortion rights, while at the same time believing the Supreme Court's decision in Roe v. Wade to be a "bad thing." This meshes with data indicating that activists are older, more religious, and likely to be married. The Tea Party identifies as "middle class" and focus on bread-and-butter economic issues. These are concerns that liberal writers like Thomas Frank, author of What's the Matter with Kansas?, thought would drive the rural "middle class" back towards the Democratic Party. On policy, however, they stand firmly on the libertarian right. They oppose universal health care and any increases in upper-bracket ($250,000 and up) taxes to fund health insurance for the less fortunate. Judging from this data and the protesters' rhetoric, there is no basis for warnings of a rising tide of racism or sightings of a nascent fascist threat. Nor is there cause to see the Tea Party as the political articulation of a downwardly mobile white working class. The implication of this last thesis is to imply that, if not for disorganization and elitism on the left, anti-tax protesters could have been lining the streets in favor of a European-style welfare state. Concerning racism, there has been no evidence that Tea Partiers support policies that would reintroduce structural forms of racism — in the form of literacy tests, segregation, etc. Whether or not Tea Party activists are prone to holding racist views within their subconscious or to what extent the opposition to Obama is due to his racial background, cannot be ascertained and any attempt to do so would be irresponsibly speculative. One only needs to look back as far as the response following Caucasian Bill Clinton's election in 1992, which mirrors in terms of demands and social base, if not media attention, the "Tea Party tempest" today, to see that opposition to Obama is based mainly on perceptions of his liberalism rather than race. Similarly, Tea Party views on immigration are in-step with the mainstream. The attempts of Neo-Nazi and Ku Klux Klan elements to benefit from mobilization on the right represent a predictable opportunism and there is no indication that their rhetoric has wider resonance in the movement. Claims of fascism are indicative of the wild and speculative way that word has traditionally been bandied about on the left. Though many of its shock-troops have come from lumpenproletarian elements, fascism has historically been a petit-bourgeois movement that can only be understood within the context of a militant left. German and Italian fascists disrupted strikes and physically attacked left-wing meetings. This historically specific brand of reaction implies that there was a vibrant workers' movement challenging capitalist class rule, forcing elements of those on top to attempt to gamble on empowering the fascists in order to ultimately preserve the existing class structure. The American left is a marginalized and besieged political force, not exactly ready to storm the barricades. It's also worth remembering that fascism's economic policies were wildly interventionist, while the John Galt fellaters in the Tea Party trumpet their fear of "big government." The Tea Party's own critique of Obama often invokes images of fascism — an ideology they connect to welfare state corporatism. The data also indicates that members of the new right are not disgruntled members of the working class. Nor are they social conservatives duped by straw man arguments into supporting policies that go against their economic interests, but rather individuals primarily concerned with policies that limit the scope of government, especially redistributive measures that benefit low income families. They push for conditions that would facilitate capital accumulation — deunionization and a small national debt, for example. The Tea Party stands firmly in a well-established libertarian tradition that draws from the inherited "common sense" of Americans. As Seth Ackerman writes, "At the center of the Tea Party lies this stolid Taft Republicanism. It's leagues away from the passions of the noisiest fringe types, the birthers and deathers and tenthers who fret about masturbation and the gold standard. It's a politics about the man who stands alone, about life as a solitary struggle, about society as a silent stream of elementary particles." Neoliberalism and the erosion of old forms of social integration have only fostered this philosophy. With a moderate stance on social issues, an economic program that meshes well with hegemonic neoliberal ideology, and a discourse rooted in a venerable American ethos of self-sufficiency and rugged individualism, it is unclear what "extremism" liberal commentators are alluding to. Finally, one has to question the actual reach of the Tea Party and its long-term prospects. Even at their widely acknowledged peak, the 2010 Tax Day protests, it was not politicizing a particularly large number of activists from outside traditional right-wing constituencies nor were they well received among growing demographic groups — the young and ethnic minorities. Large Republican gains in the 2010 midterm elections, which gave the party control of the House of Representatives and threatened the Democratic leadership of the Senate was taken to be a sign of the Tea Party's sway. This is another misreading. Republican victories in 2010 should have come as no surprise, even without the emergence of the Tea Party. The party that commands the Executive normally loses seats in midterm elections and poor economic indicators are sound predictors of ruling party electoral collapse. Public confidence in both parties, the Democrats and the Republicans, has dipped, but a poll has shown that a Democratic message focusing on the middle class and job creation would garner more public support than a Tea Party-esque one based around spending and the deficit. The perception of the Tea Party as an anti-immigrant movement has also helped alienate Hispanic voters, a key component in Karl Rove's strategy for building a right-wing majority coalition. Even with dozens of representatives in the so-called "Tea Party" caucus, it remains to be seen what tangible legislation the movement will push through. If the history of the 1990s — which saw Democratic gains in 1998 in the best showing for an incumbent president's party since the Great Depression — is any example, then the right's electoral gains may be short-lived. Despite the media attention, from FOX News' adoring coverage to hysterical denunciations on MSNBC, the Tea Party's real importance is still up for debate. Other social movements, those of the left, that barely garner media attention — the immigrant rights movement, the protests against austerity in Wisconsin, and union mobilizations like the One Nation rally held last fall in Washington — certainly seem better positioned demographically to make a lasting impact. The tale of the Tea Party, full of sound and fury, may signify nothing. If the Tea Party is part "media event" and part the resurgence of a trite anti-government populism among conservatives of relative wealth, some will question the pedagogic value of a sustained analysis of it. In my opinion the liberal-left's response to the Tea Party "tempest" is of interest, because it points to a political paradigm and ideological climate that is uniquely American. These features are indebted to the United States being the only advanced capitalist nation without a labor-based party. Traditional explanations for the lack of a working class political formation — Werner Sombart's Why Is There is No Socialism in the United States?, for example — argue that there was too much prosperity and too few economic grievances to catalyze such a party. Other accounts focus on the impact racist ideology had on the development of class consciousness or the structural constraints the American electoral system places on third party efforts. Louis Hartz's thesis in The Liberal Tradition in America is that a prevalent egalitarianism of social status in a country without a feudal legacy meant that a liberal ideology of "Americanism" could serve as a substitute socialism for the masses. However, it is more likely that a party could have been formed but was not. Robin Archer argues in Why Is There No Labor Party in the United States? that the aforementioned theorists were making a mistake by comparing "virginal" America with the Old World. A comparison to Australia is more apt. That country was also prosperous, had entrenched racial divisions, and in the late nineteenth century boasted a single-member district plurality system. Though American activists faced more repression than their Australian counterparts and their country was more rife with religious differences, it stands to reason that the lack of independent class representation for American workers was a result of conscious political decisions and defeats in industrial confrontations rather than a preordained outcome. Without a labor party, the bulk of the American left has been tied to the Democratic Party, a social liberal, not socialist, formation. The dominant intellectual climate has, similarly, favored liberals rather than radicals. The growth of highly organized, mass membership political parties was a development of the late nineteenth and early twentieth century, starting first in Germany. It was a conscious advance by the proletariat. That the Democratic and Republican parties retain a looser political structure than their counterparts elsewhere finds reflection in their relatively inchoate, and at times self-contradictory, politics. They are only parties in the broadest sense. Open to all, they have no ideological requirements for membership. Anyone can register as either a Democrat or a Republican, making them little more than coalitions of social forces in which various groups contest for influence under a common banner. Class interests are watered down in the big tent of the Democratic Party, a party that has historically stood in the political center. Reeve Vanneman and Lynn Cannon's study, The American Perception of Class, showed that self-identified "working class" voters in the United States, without a party like Labour to flock to like their British peers, simply do not vote. The Democratic Party, which has a monopoly of left-of-center social forces, finds its support among those who self-identify as "middle class," hampering class consciousness. The left, without a natural base and condemned to support the "lesser evil," has traditionally conceded ground to "legitimate" forces governing in the center. Their enemy has never been systemic — capitalism or the state — but rather the political right. Coverage at The Nation during the past two decades shows this logic at work. Clinton was critically supported by the publication, despite his position at the vanguard of neoliberal restructuring through his pursuit of "welfare reform" and other entitlement cuts. Democratic policy could be wrong, but the idea that all segments of the diverse Democratic Party were good faith partners with "progressives" was rarely questioned. The result was a synthesis of dull policy-based objections to individual Democratic Leadership Council proposals only occasionally interrupted by the magazine's few radical voices like Christopher Hitchens and Alexander Cockburn, writers who pitched their criticisms of the Clinton administration at a polemical, personal level. In the 2000s, the magazine was once again an opposition force, but its hyperbolic rants against the new Bush administration never articulated a clear critique of the structures and social forces that brought to bear on that presidency. Today, it should come as no surprise that the left has wedded its analysis of the right to examinations of "paranoid styles," or "false consciousness," as if right-wing political opinion were a disease to be treated or a form of mass hallucination. The preponderance of identity politics epitomized by Melissa Harris-Perry's examination of the Tea Party through the prism of race and racism has filled the void of class analysis. Moralizing bombast and guilt by association have taken root over concrete examination and good-faith argument, as the American liberal-left press has settled for impressionistic pieces filled with contempt. There is nothing novel about this hysteria. Nor is there anything novel about the Tea Party, a loud but fleeting explosion of right-wing populism. Matthew Rothschild, "Chomsky Warns of Risk of Fascism in America," The Progressive, 12 Apr. 2010. The Nation ("Health Care's Bitter Opponents," 7 April 2010). Melissa Harris-Perry, "Lose the Love/Hate, But Keep the Hope," The Nation, 28 Sept. 2009. Steven Greenhouse, "In America, Labor Has an Unusually Long Fuse," New York Times, 5 Apr. 2009: WK3. Melissa Harris-Perry, "How Barack Obama is like Martin Luther King, Jr.," The Nation, 17 Jan. 2010. Melissa Harris-Perry, "Is this the Birth of a Nation," The Nation, 22 Mar. 2010. Leo P. Ribuffo, The Old Christian Right: the Protestant Far Right from the Great Depression to the Cold War, Philadelphia: Temple UP, 1983. Melissa Harris-Perry, "End Don't Ask, Don't Tell," The Nation, 2 Feb. 2010. Justine Sharrock, "Oath Keepers and the Age of Treason," Mother Jones, March/April 2010. Matt Taibbi, "The Truth About the Tea Party," Rolling Stone, 28 Sept. 2010. Frank Rich, "The Axis of the Obsessed and Deranged," New York Times, 27 Feb. 2010: WK10. Ken Silverstein, "'Hate,' Immigration, and the Southern Poverty Law Center," Harper's Magazine, 22 Mar. 2010. Ken Silverstein, "This Week in Babylon," Harper's Magazine, 2 Mar. 2007. Alexander Cockburn, "King of the Hate Business," CounterPunch, 15-17 May 2009. David Barstow, "Tea Party Lights Fuse for Rebellion on Right," New York Times, 16 Feb. 2010: A1. Sean Wilentz, "Confounding Fathers," New Yorker, 18 Oct. 2010. Richard Hofstadter, The Paranoid Style in American Politics, and Other Essays, Cambridge, MA: Harvard UP, 1965. Mary C. Brennan, Turning Right in the Sixties: the Conservative Capture of the GOP, Chapel Hill: University of North Carolina, 1995. Marvin and Betty Mandell, "From the Editors," New Politics, Winter 2010: 5. Alexander Cockburn, "Move Over, Axis of Evil," The Nation, 22 Mar. 2010. Walter Benn Michaels, "Let Them Eat Diversity," interview by Bhaskar Sunkara, Jacobin, Winter 2011: 17-22. "Who are the Tea Party activists?" CNN Politics, 17 Feb. 2010. "Behind the Headlines: What's driving the Tea Party Movement?" The Winston Group, 1 Apr. 2010. Kate Zernike and Megan Thee-Brenan, "Poll Finds Tea Party Backers Wealthier and More Educated," New York Times, 14 Apr. 2010: A1. Thomas Frank, What's the Matter with Kansas? : How Conservatives Won the Heart of America, New York: Metropolitan, 2004. Leon Trotsky, Fascism: What It Is and How to Fight It, New York: Pathfinder, 1972. Jonah Goldberg, Liberal Fascism: the Secret History of the American Left, from Mussolini to the Politics of Meaning, New York: Doubleday, 2007. Seth Ackerman, "The Politics of Being Alone," Jacobin, Winter 2011: 25. "How To Tell If Obama Blew the Election, Or If It Was Blown At All," New Republic, 29 Oct. 2010. "Can Democrats Still Win?" New York Times, 23 Oct. 2010: WK12. Werner Sombart, Why Is There No Socialism in the United States? White Plains, NY: International Arts and Sciences, 1976. Louis Hartz, The Liberal Tradition in America: An Interpretation of American Political Thought since the Revolution, San Diego: Harvest Book, 1991. Robin Archer, Why Is There No Labor Party in the United States? Princeton: Princeton UP, 2007. Jason Schulman, "On 'Realignment' and the Left," New Politics, Winter 2002. Reeve Vanneman and Lynn Weber Cannon, The American Perception of Class, Philadelphia: Temple UP, 1987. BHASKAR SUNKARA is the editor of Jacobin and an undergraduate at The George Washington University. BHASKAR SUNKARA is an undergraduate at The George Washington University and the editor of Jacobin (http://jacobinmag.com), a D.C.-based publication. BHASKAR BEGINS HIS ARTICLE by noting that Noam Chomsky is afraid. Well, we are, too. Like Chomsky, we heard the sounds of fear and hatred in Tea Party rallies, and they remind us of the sounds of fascism. Of course this is not full-blown fascism, with brown shirts stomping in the streets, but incipient fascism, in our view. Bhaskar writes of our editorial note in NP 48, winter, 2010: “It is made explicit that the left’s ‘main fire’ should be directed at their mirrors on the right and not policy makers in Washington.” This is not true. We never said explicitly — or implicitly — that the “main fire” should be directed at the right and not at the Obama administration. We think Bhaskar’s misunderstanding stems from our allusion to the actions of many German leftists of the early 1930s who struggled against others on the left rather than against the Nazis. We should have made it clear that the Tea Party is not yet a fully developed fascist organization. (Maybe it will never be, as he seems to think.) But after the election of the first black American president, militia groups increased in number from 512 in 2009 to 824 in 2010 (a 61 percent rise). Many militia members have carried weapons to Tea Party rallies. And Tea Party favorites like Sarah Palin and Sharron Angle have threatened to use them. When and IF the militia groups leave their forest training grounds and invade our cities and towns, then we should heed the warning Leon Trotsky gave in the early 1930s and turn our main fire against the fascists. But Bhaskar knows that New Politics has not pulled any punches in its many articles on Obama, or on political developments in general (his own articles included). We think Bhaskar minimizes the racist underpinnings of the Tea Party. He says that Tea Partiers oppose Obama not for his race but for his liberalism, much as they opposed Bill Clinton. But did they ever demand Clinton’s birth certificate? Tea Party leaders have used coded — and even uncoded — words to express their racism: “Let us take back America!” “This is the real America!” etc. Bhaskar says that “there is no evidence that Tea Partiers support policies that would reintroduce structural forms of racism — in the form of literacy tests, segregation, etc.”; but even while he was writing this, Tea Party-supported legislators and governors in Texas, Florida, Wisconsin, and elsewhere were pushing for laws requiring rigorous voter IDs and making voter registration drives almost impossible — mostly directed against people of color. Bhaskar refers to “the racial slurs allegedly hurled at Representative John Lewis.” Why “allegedly”? Didn’t we all witness this on video? Dale Robertson, a leader of the 1776 Tea Party, has used out and out racists and anti-Semites on his Tea Party Hour radio program. Several Tea Party Patriot groups officially call themselves militia groups. The Council of Conservative Citizens, a direct descendant of the white Citizens Councils, is the largest white nationalist organization in the country and the group most active in the Tea Parties. Bhaskar is of course right that we shouldn’t overstate the threats we face, but understating them — as we think Bhaskar does — could be extremely dangerous. "A Thousand Platitudes: Liberal Hysteria and the Tea Party"
When I joined the SP-SDF in the late 60s, the National Office was distributing a phamphlet entitled, “The American Ultras” written by Irwin Suall, former national secretary. I didn’t find any platitudes or hysteria in Suall’s phamphlet. The SP-SDF’s Norman Thomas had been focusing on the US military’s use of John Birch Society “film strips” and “motivational anti-communist speakers.” Thomas denounced the practice of using extremist literature, speakers and films, aimed at young recruits ordered to attend meetings. Norman Thomas received a lot of favorable mainstream press for his efforts. You need not be a supporter or contributer to the SPLC to notice an uptick in extremist and rightwing grass roots activity in the US. The Tea Party is a big part of the right wing ascendancy. Nowhere in his entire article does B. Sunkara mention that the Tea Partisans elected eighty four of their adherents to the US House of Representatives in 2010. In one election, the Tea Partisans outnumbers the Progressive Caucus in membership. The Tea Party movement has been problemmatic on the race issue. Tea Party rallies in Washington, DC and elsewhere exhibit racist signs and slogans. The racialist bent of the Tea Party has been televised for the world to see. The SPLC and the NAACP should continue to monitor and report on the use of racial appeals by the Tea Party. The Tea Party may also be infiltrated by neo-nazi, skin-head and other extremist groups. B. Sunkara ignores that “Socialists” and “Socialism” are the big targets of the Tea Party, together with the “undeserving poor” (i.e. minorities, Blacks and Latinos, youth). I’m disappointed by the lack of movement knowledge exhibited by many adherents on the democratic left, today. I strongly recommend “The Politics of Unreason: Right Wing Extremism in America, 1790-1970 by Seymour Martin Lipset and Earl Raab. Without an historical background there can be no understanding. In “Perspectives on Politics,” (March 2011, Vol.9, No.1)” published by the American Political Science Association, Vennessa Williamson, Theda Skocpol, and John Coggin authored, “The Tea Party and the Remaking of Republican Conservatism,” a highly sophisticated analysis, complete with extensive field research. Nobody thinks Sean Walentz’s “New Yorker” article was hysterical and full of platitudes. He called out the persistant influence of the “constitutional conservatives” (translation: John Birch Society)on American public opinion. It is serious when Sharron Angle, a Tea Party endorsed US senate candidate, calls for “Second Amendment Solutions.” This is a gun happy country, you know? It is unlikely that Noam Chomsky would be calling for the coercive power of the state, give his anarchist (“libertarian socialist”) beliefs. Delighted to hear MSNBC runs specials on Timothy McVeigh and the growing American militia movements. (Remember Norman Thomas). Clearly, there is a wiff of “Jim Crowism” in the Republican/Tea Party attacks on voter rights, early voting restrictions, Government issued photo-ID cards, to be presented at the polls. There are some members of the Democratic Left that are minimizing the influence of the Tea Party and the organized Right wing. I’m not sure where “playing down” the existance of a Right Wing ascendancy is leading these thinkers. They don’t see it as a problem. question. How is liberal left question. How is liberal left ows different from the conservative right Tea Party movement?